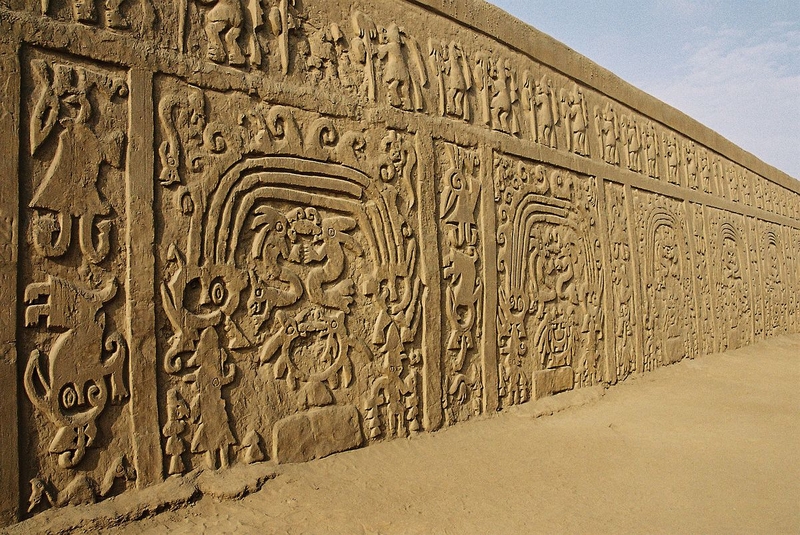 Not far away from the Peruvian modern Trujillo, which is situated near the Pacific Ocean, there is a little-known, but very impressive in size city of ancient Indians - Chan Chan. 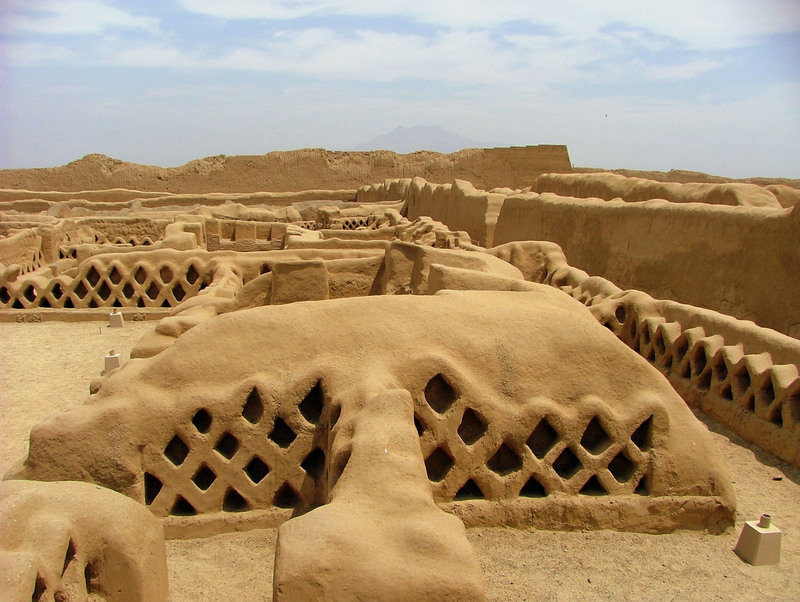 Once, before the Incas came to these lands, it was the main city for the people of Chim. Their god was the moon. The main fishery for these people was fish. It was not only caught from the ocean, but also bred in fresh, artificially created lakes in the territory of Chiang Chan. These people also knew how to handle ceramics, could apply a thin layer of gilding on various products, bred livestock, and led predatory wars. 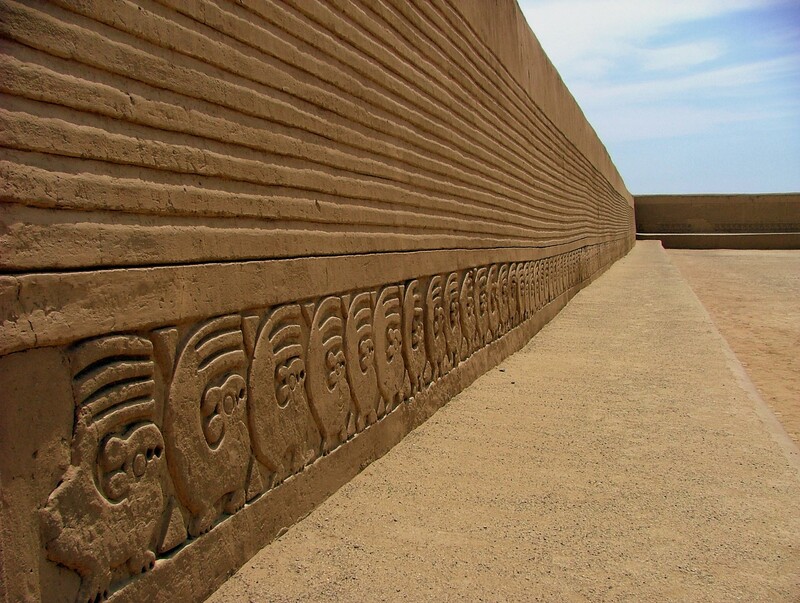 Their language was spoken in some regions of Peru at the beginning of the last century. The city was rich. Archaeologists in his land still find a lot of gold and gilt items. In the blossom of the settlement, about one hundred thousand people lived in Chiang Chan. This is quite a lot, if we recall that in Machu Picchu, in his best years, lived five times less. A city was made of clay and straw. Scientists do not fully understand how Chiang Chang survived, given the fragility of such building material. Its walls withstood invasion of the Incas. They failed to invade the city by force. They won it by cunning, blocking the river, near which the people of Chim built their capital. The greatest destruction of Chiang Chang is suspected after the conquest of the continent. Today it is being restored. Recently it was listed as a UNESCO World Heritage Site. In ancient tombs are found precious stones and ceramics are found out. Archaeologists work in Chiang Chan now. The excavation area is about twenty kilometers. It is already clear that Chiang Chan was protected in a circle by a wall, there complicated multilevel irrigation canals were dug and the reservoirs were excavated. The ground part is a series of labyrinths and thick walls. The city itself was divided into ten sections. All of them were surrounded by their walls. Inside each district there were squares, temples, houses, water storage and provisions. All the walls of the ancient masters were decorated with ornaments: birds, fish and graphics. Most often there are images of pelicans, crabs and turtles. The voluminous carved figures were painted with black, white or yellow paint. Of course, now the walls are burned out and the color has lost its depth. The religious centers of Chiang Chan were the Temple of the Emerald and the Temple of the Dragon. Both sanctuaries are decorated with unusually beautiful and geometrically correct drawings on the theme of the sea. - Chan Chan is in the north of Peru. You can get to the city by taking a bus in Lima.